Burma, an aa kent as Myanmar an offeecially the Republic o the Union o Myanmar, is the lairgest kintra bi geographical aurie in mainland Sootheast Asie. The kintra is bordered bi Fowkrepublic o Cheenae on the north-east, Laos on the aest, Thailand on the sooth-east, Bangladesh on the wast, Indie on the north-wast an the Bay o Bengal tae the sooth-wast wi the Andaman Sea defining its soothern periphery. Ane-third o Burma's tot perimeter, 1,930 kilometers (1,199 mi), forms an uninterrupted coastline. "Burma" is derived frae the Burmese wird "Bamar" ( ), which in turn is the colloquial form o Myanmar ( ) (or Mranma in auld Burmese), baith o which historically referred tae the majority Burmans (or the Bamar). Dependin on the register uised the pronunciation wad be "Bama" (pronounced: [bəmà]), or "Myanmah" (pronounced: [mjəmà]). The name "Burma" haes been in uise in Inglis syne the time o Breetish colonial rule. 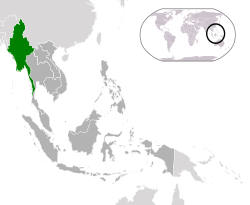 The kintra is dividit intae seiven states (ပြည်နယ်) an seiven regions (တိုင်းဒေသကြီး), umwhile cawed diveesions. The annooncement on the renamin o diveesion tae regions wis made on 20 August 2010. Regions are predominantly Bamar (that is, mainly inhabitit bi the dominant ethnic group). States, in essence, are regions which are hame tae parteecular ethnic minorities. The administrative diveesions are further subdividit intae destricts, which are further subdividit intae tounships, wards, an veelages. Belaw are the nummer o destricts, tounships, ceeties/touns, wards, veelage Groups an veelages in each diveesions an states o Burma. ↑ "The World Factbook – Burma". cia.gov. Archived frae the oreeginal on 4 November 2010. Retrieved 4 May 2016. ↑ Wang, Ann (30 September 2017). "Why the Rohingya will never be welcome in Myanmar". South China Morning Post. ↑ The 2014 Myanmar Population and Housing Census Highlights of the Main Results Census Report Volume 2 – A. Department of Population Ministry of Immigration and Population. 2015. ↑ 6.0 6.1 6.2 6.3 "Burma (Myanmar)". World Economic Outlook Database. International Monetary Fund. ↑ "တိုင်းခုနစ်တိုင်းကို တိုင်းဒေသကြီးများအဖြစ် လည်းကောင်း၊ ကိုယ်ပိုင်အုပ်ချုပ်ခွင့်ရ တိုင်းနှင့် ကိုယ်ပိုင်အုပ်ချုပ်ခွင့်ရ ဒေသများ ရုံးစိုက်ရာ မြို့များကို လည်းကောင်း ပြည်ထောင်စုနယ်မြေတွင် ခရိုင်နှင့်မြို့နယ်များကို လည်းကောင်း သတ်မှတ်ကြေညာ". Weekly Eleven News (in Burmese). 2010-08-20. Retrieved 2010-08-23. Wikimedia Commons haes media relatit tae Myanmar. This page wis last eeditit on 2 August 2018, at 05:31.